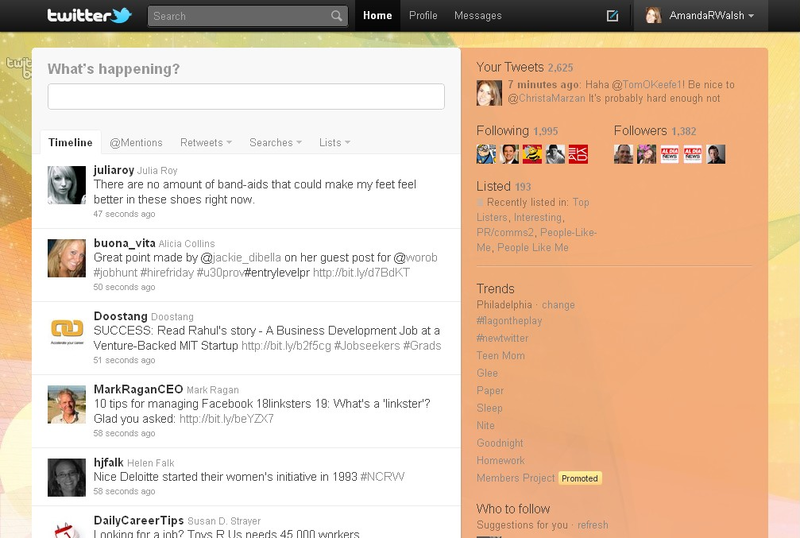 The Internet has been all a-buzz with the latest news on the new Twitter look and layout. I finally noticed a button on the top of my Twitter landing page this morning that invited me to check out the #NewTwitter. I was met with a pleasant surprise! 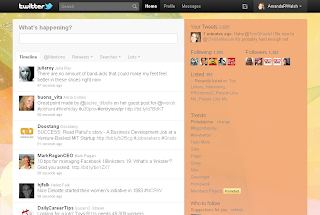 Twitter has had a complete makeover! 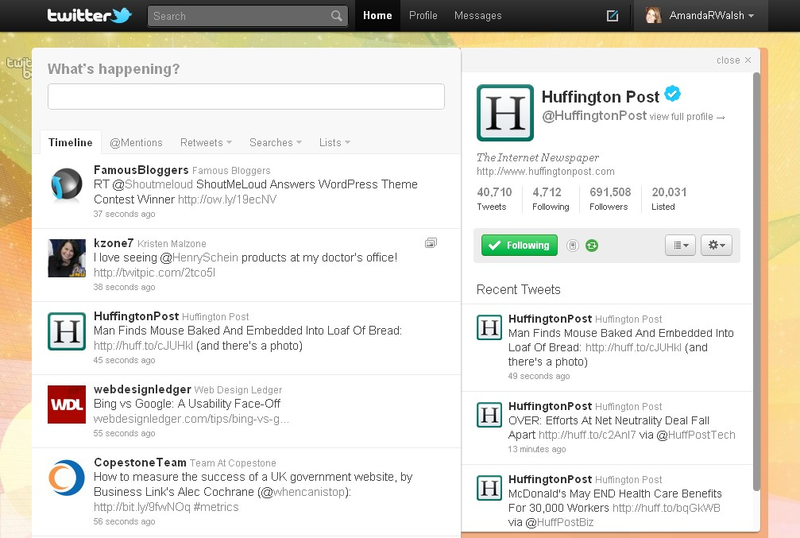 I noticed right away that the new interface is more interactive and streamline. Now, the news stream is located on the left hand side of the screen, which frees up room on the right for featuring your number of followers, number of people who follow you, and trending topics for searching. The change I like the best is when you click on a fellow user’s tweet, their profile and a few of their recent tweets pop up to the right. You are able to read their profile on the right while continuing to monitor your news feed on the left. New partnerships with YouTube, Flickr, and Vimeo make it even easier to see embedded photos and videos on the right-hand side of the screen. So far, so good, Twitter! I like the new layout and right now on my personal account, I still have the option to toggle back and forth between the old layout and new layout. The Furia Rubel corporate account does not have the option to review the new Twitter yet, but I’m sure as the weeks go on Twitter will continue to roll out the new features for all users. There are some relevant points that are outlined in the article, but Laura notes that one thing the article overlooks is the strategy behind developing pieces that need to be designed. Below, she adds her tips for communicating with the designer during the creative process. One of the most critical parts of communicating needs and expectations with a designer is strategic planning. By developing a company’s communications plan that identifies target audiences and outlines key messages (among other things) before engaging a designer, professional designers will be better equipped to begin the creative process. A large piece of design development is evoking emotion with visual elements. When developing a brand, creating print collateral or extending an online presence, a company’s strategic communications plan will guide the design of the materials by identifying how the company wants to be perceived in the marketplace and influence its audiences. In this way, the planning process becomes a foundational cornerstone of working effectively with a designer. To read the Mashable article, check it out here. Contrary to what some have been saying, the press release is not dead! A recent article featured on the Search Engine Watch.com blog reaffirms the important role of this public relations tool and defends optimized press release usage within the public relations industry. “There are a variety of reasons why the Furia Rubel team utilizes the press release. The PR tool helps us to ensure that we have all accurate and relevant information from our clients, compiled it in one place with details and contacts. In this way, press releases are an invaluable resource when directly pitching media representatives because everything is clear, concise and together in one space. Also, with each release we write, our team specifically incorporates SEO language to increase online visibility for our clients,” said Leah Ludwig, Senior Account Manager at Furia Rubel. 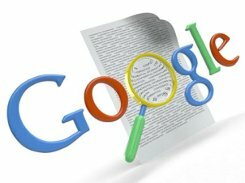 If journalists are using Google to research, an effective way for public relations professionals to get their news out there is through an optimized press release. A new challenge has presented itself however, because press releases are competing with news media for top search results. This does not mean that the press release is dead, just that it is important for SEO experts to stay abreast of the changing SEO terms and results. I learned that earlier this year LinkedIn partnered with Microsoft Outlook. I wanted to share the exciting news with our readers because some people may not have heard about it, I certainly hadn't! Microsoft Outlook is a popular email program that many businesses use to communicate internally, schedule meetings, store contacts and much more. LinkedIn is an online professional social-networking site where you can find and connect with colleagues, classmates or any professional contact who you have met throughout your career. Many people are using LinkedIn as a networking/job search tool or a forum to ask questions and receive expert feedback. Professionals can now use this tool to connect the two programs and grow their networks even further. 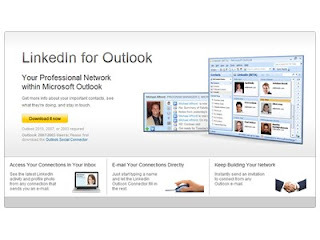 To read more about how you can download and install the Outlook Social Connector, check out this The LinkedIn Blog entry. Kate Bladow over at Technola.la posed a challenge to bloggers everywhere last week; to post one blog post between October 24 and October 30 in honor of the 2010 National Pro Bono Celebration. The week- long celebration is sponsored by the ABA Standing Committee on Pro Bono and Public Service. Last year, the celebration was a success but as Bladow notes, "only a few bloggers published posts to recognize the lawyers and paralegals who provide free legal services to those who can't afford to pay." To participate, write a post about what pro bono means to you. You don't need to be a lawyer, but lawyers are certainly encouraged to participate. You could be a client, for example, who received pro bono services or you could comment on what you admire about a legal colleague for their dedication to pro bono work. The options are endless! Bladow does a wonderful job of giving some ideas to help get you started. Check out her challenge here. We'll also be participating over here at ThePRLawyer! Are you a frequent PR Lawyer blog reader? Do you find the entries that we post are helpful and relevant for you and your business? The American Bar Association Journal & Blawg 100 Amici are looking for nominations of the best legal blogs on the Internet to compile a top 100 best legal blogs (or blawgs). These should be the blogs that you visit regularly and think lawyers and other legal professionals should be checking out too! To submit your vote, check out the ABA Journal website here. Votes are due no later than October 1, 2010. Please join us in congratulating Gina Rubel, CEO/President of Furia Rubel Communications, who will be honored by The Justinian Society on October 4, 2010 with the Lisa A. Richette Outstanding Woman in Law Award. The Honorable Dan Onorato will present the keynote. We'll be there and hope many of our friends can join us. To learn more information or to register, please go to the Justinian Society website. * Before Google Instant, the typical searcher took more than 9 seconds to enter a search term, and we saw many examples of searches that took 30-90 seconds to type. 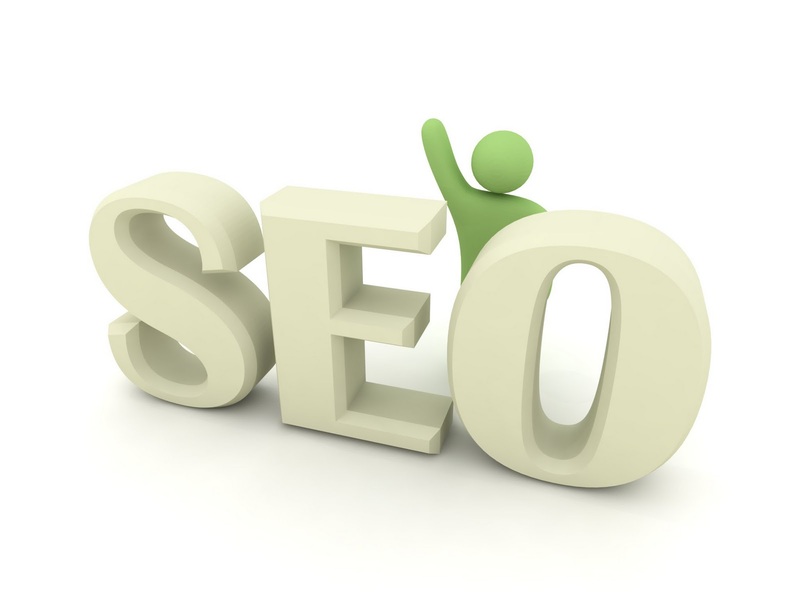 * Using Google Instant can save 2-5 seconds per search. * If everyone uses Google Instant globally, we estimate this will save more than 3.5 billion seconds a day. That’s 11 hours saved every second. * 15 new technologies contribute to Google Instant functionality. The Google Instant unveiling comes after a week of tantalizing “doodles” or logos on the Google landing page that kept everyone wondering what the big surprise would be. On September 7, the company made public a fun, kinetic-like “doodle” or logo on the landing page. Dozens of boisterous balls formed the Google logo but scattered when the user brought their mouse arrow near. Check out a video here. The very next day, another doodle was put up on Google.com that featured a colorless Google logo. When a user began to type in their search query, the letters in the Google doodle would be filled-in with a different color after each keystroke. Read more about that here. In my opinion, Google did a great job growing buzz around the unveiling of Google Instant. Everyone took notice of the changing logos and the people at Google posted tweets to build curiosity even more. What do you think about Google Instant and the build up to the unveiling of the new feature? The more important question that has the blogosphere humming is, how do you think Google Instant will effect Search Engine Optimization? I'm curious to see more statistics and numbers as website analytics show the effects this new feature. Stay tuned! The Furia Rubel team wants to share some news about interesting search tools from Google with ThePRLawyer audience. Google Realtime search allows you to look for results in Google as they are happening. The search compiles results from Twitter, Facebook, blog posts, and websites to give you real time content that is live and continuously updated. The user can also specify the location of where the news is coming from. For example, the keyword “Obama” can be narrowed down to view only the keywords produced from a specific city or state. Many times you can find breaking news before major news outlets have the opportunity to release them. This is a great marketing tool for any brand or business that wants to stay on top of breaking news or crisis communications. Another feature from Google is the new YouTube Channel, the Google beat, which brings updates of the latest weekly trends in Google searches within the U.S. 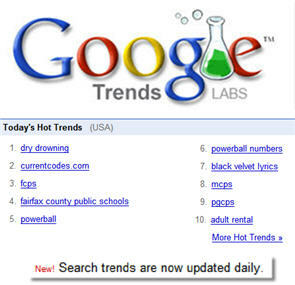 The video, formatted in a news-style way give a rundown of the latest search trends. For example, this week “Hurricane Earl” and “Paris Hilton” were two huge search terms. These two new features from the search giant raise some interesting food for thought - Is Google trying to compete with Twitter in the department of trending topics? The popular micro-blogging service presents real-time updates of news from around the world and can be narrowed down by keyword. 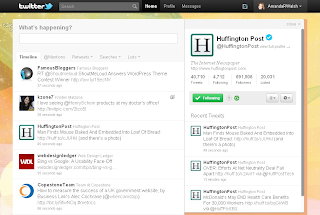 It seems lately that Google is moving in the Twitter-based, newsfeed direction with their recent feature rollouts. The Google beat, YouTube channel, also brought to my attention other tools that Google offers such as Google Trends, Hot Trends, and Google Insights for Search. The Year-end Zeitgeist feature is the most interesting to me because it provides a snapshot of the year in search trends. All of these provide the user the ability to check out what is hot right now or what have been the top search trends over an entire year. As technology and features from Google continue to grow, we continue to build archives of our culture. With an archive reaching back to 2001, anyone can see the gaining and declining trends of that year. Again, searching trends and these new features from Google can be very useful for professionals in the marketing and public relations industry to keep an eye on the changing trends across the country. On Wednesday, September 22, 2010, Gina Rubel, Esq., President/CEO of Furia Rubel Communications, will speak at the Small Business Solutions Center of Delaware County Community College’s “Your Business and the Economy 2011” economic forum. Rubel will address “Marketing and PR on a Shoestring Budget: How to Manage the New Economy.” The event will be hosted from 11 a.m. to 1 p.m. at Terrazza in Newtown Square, Pa. Beneficial Bank of Philadelphia and the Widener University Small Business Development Center will co-sponsor the event. A full lunch will be served and admission is $10. To attend or learn more about this event, call the Small Business Solutions Center’s Danielle Cipolloni at 610-723-1229.